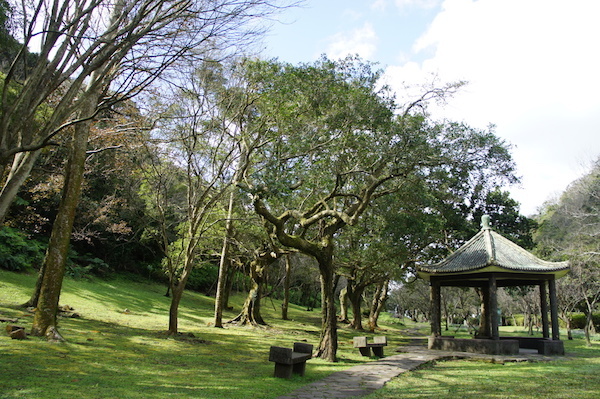 Yangmingshan National Park is one of nine national parks in Taiwan, sitting between Taipei and new Taipei City. It is very accessible via public transport. The area has many km of trails for hiking, including some serious mountains. There are numerous roads in the area — but they can be quite steep and not all have a decent sidewalk or shoulder. And the ‘hiking’ trails are challenging except for experienced trail runners. And they can be crowded, so best to go early or not on a weekend if you’re planning to run. There are also some good pedestrian paths that make for easy to moderate trail running. The trails and roads are well marked and maintained. This is a good site in English that has details on all the trails. Note: this park is very hilly! Balalaika Highway Pedestrian Trail. 2.5 km one-way, only 93m elevation gain. Start from Mt. Qixing Bus Stop or Erxiping Visitor Center. Lengshuikeng-Qingtiangang-Mt. Qixing Pedestrian Trail. Very pastoral and more open. It’s 1.8 km from Lengshuikeng Visitor Centerto Qingtiangang grassland, 51m elevation gain. It’s 4.1 km one-way to the Mt. Qixing Bus Stop (map here), which includes the Macao Bridge, which is a treat for running and lit at night! Yangming Park & Flower Clock. Some pleasant running on the roads and trails around here. There’s a smattering of trails, and a sidewalk along the road in this area. Most of the running in the park is hilly!